Rosdarrig is a modern home offering Bed and Breakfast, genuine Irish hospitality and quality accommodation. Brenda is a lovely and gracious host. 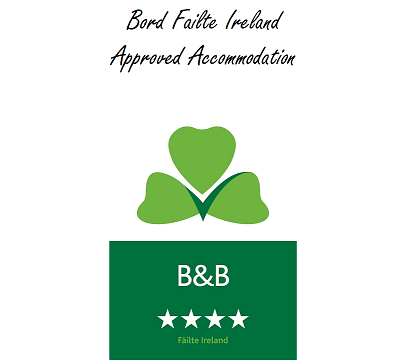 The B and B is well appointed, close to Boyle, and Brenda gives excellent advice about local attractions. The view from our window was wonderful - a great introduction to Ireland. She and her staff were friendly and the breakfast was plentiful and delicious . We loved staying there. My family had a wonderful stay at the Rosdarrig B & B. We enjoyed talking with Brenda and she was very nice. The rooms were lovely and very clean. We had everything we needed. It is in a great location and her garden is very pretty. The breakfast was good. We really enjoyed our stay and would Highly recommend it to all. What can I say? Brenda was amazing. When we arrived she sat down with us and offered us some tea and cake (which was amazing). She and her staff were very friendly. The room was beautiful and there was even a claw foot tub in our bathroom that I just had to take advantage of using. It was an easy walk from Rosdarrig to the little village of Boyle which has some pretty amazing things to look at. The Abby and the Kings house (which was closed on Monday) so we couldn't take the tour. It is also close to Carrick-on-Shannon. The food was great and I look forward to coming back again. A lovely bed and breakfast. After a long day we enjoyed some wine and whiskey on the lovely side patio. Brenda provided glasses, ice and a little snack that made things so enjoyable. The room was very nice with a great view of the farm along side the house. Breakfast was yummy! One of our favorites for sure. Rosdarrig was one of our favorite places to stay on our trip! Brenda was wonderful; she was thoughtful and spent much time getting to know us. The home is beautiful; well kept, very clean and many amenities that we loved. Breakfast was amazing! I would definitely recommend Rosdarrig!